Slow Cooker Honey Sesame Chicken will quickly become one of your weekly recipes when you realize how easy it is to make at home. Every month there I have Pricer pick out a recipe he would want me to make for my Secret Recipe Club post. Sometimes I give him a few suggests or restictions, like I’m not feeling like making cookie or pizza then, but other than that he gets pick. I love having him involved and I love to see what intersts him. 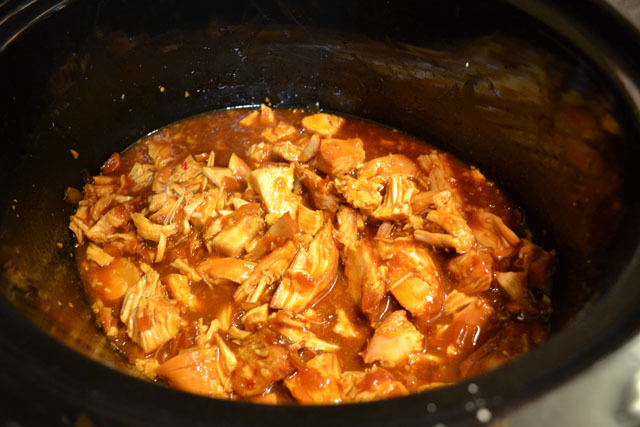 Well, this month I sent him over to check out the recipe index for Erin’s blog called the The Spiffy Cookie and he picked her Slow Cooker Honey Sesame Chicken. It sounded good to me so I was looking forward to when I’d make it. We love to get Chinese food take out but 99% of the time I order shrimp as I do not like the quality of chicken dishes at Chinese food places so this would give me the chance to have some good Honey Sesame Chicken. Plus much cheaper, fresher, and healthier than take out. This recipe was so super easy. There was very little prep and active cook time and the rest of it was just letting it do its own thing in the slow cooker. I got it all started by mixing up the sauce, adding it to the chicken, and let it be for about 3 hours. Around that time I cut up my brocolli and got my rice going in my rice cooker. When I needed to take the chicken out I added some corn stach to the sauce to thicken it and while I was cutting up the chicken I added my broccoli in my steamer basket to my rice cooker. Perfect for a great Sunday night dinner. Plus, I had very little clean up which is always a win as well. I just about made the recipe exactly as Erin wrote it, with the exception that i steamed the broccoli instead of sauteeing it, and it came out exactly as described. Don’t you just love when that happens?! Plus it was super tasty. Overall, I think it was a little sweet to me but I typically LOVE really spicy Chinese food. If you do then maybe you can increase the amount of red pepper flakes or add some Siracha to the sauce. While this is a slow cooker meal I think it can be converted into a week night super meal by cutting up the chicken and cooking it in the sauce in a skillet while you cooke the rice. I only wish I made a double batch so I would have had leftovers for all week. This def beats spending too much money on a sandwich or salad for lunch. 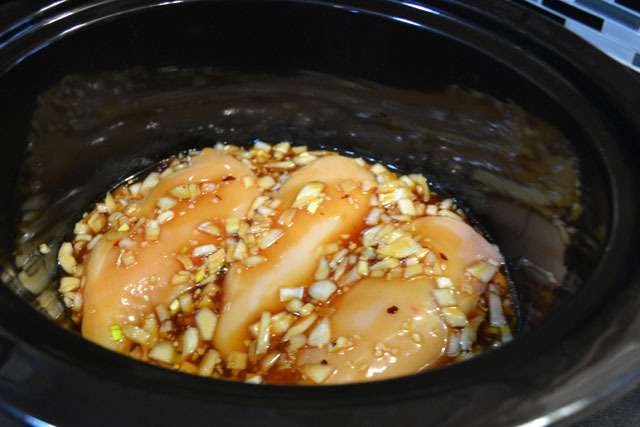 Put the chicken breasts in crock pot. 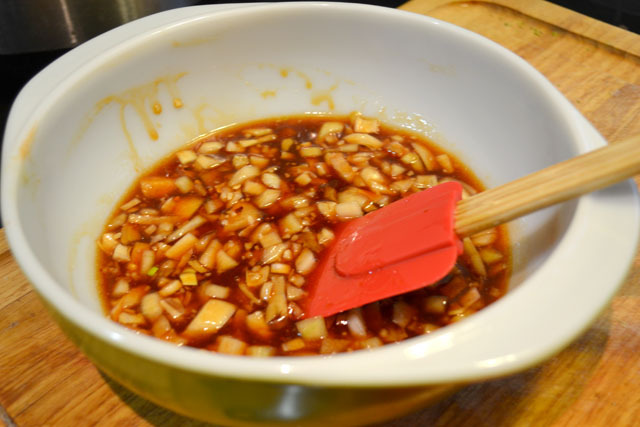 In a small bowl, combine the honey, soy sauce, onion, ketchup, oil, garlic, and redpepper flakes. Pour over chicken in the slow cooker. Cook the chicken on low for 3-4 hours or on high 1 1/2 – 2 1/2 hours, or just until chicken is cooked through. Heat 1 teaspoon olive oil in a skillet until hot. Add broccoli and saute 5-6 minutes or until cooked but tender. Or steam the broccoli instead of sauteeing. 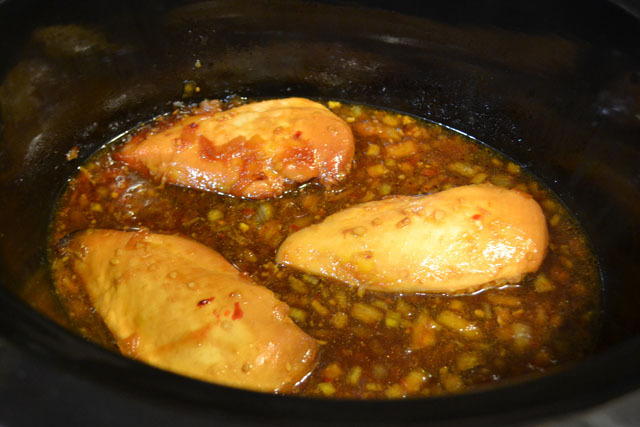 Remove chicken from crock pot, leave sauce. Whisk the cornstarch into liquid in the crock pot. Replace lid and cook sauce on high for ten more minutes or until slightly thickened. Shred chicken or cut into bite size pieces, then return to pot and coat with sauce. Serve chicken over rice with broccoli, garnish with sesame seeds.